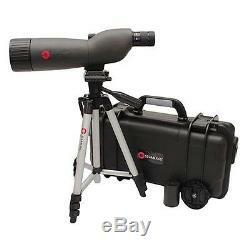 Simmons ProSport 20-60 x 60mm Waterproof/Fogproof Spotting Scope with Tripod. Message us for return instructions. Quality optics with stunning HD clarity. 100% quality materials used and tested extensively. Beautiful design and durability built to last. 20 to 60x magnification and 60mm objective lens spotting scope. High-quality BK7 prisms with fully coated optics for bright, sharp images. Red non-slip ruer armor absorbs shock and provides a firm grip when wet. 100 percent waterproof and fogproof with built-in sunshade for glare reduction. Includes tripod, soft case and premium hard-shell plastic case. Featuring fully coated optics and a red waterproof housing, the Bushnell Simmons 20-60x 60mm spotting scope delivers targeting results in full brilliance almost as fast as you can punch holes. The powerful, lightweight scope is equipped with high-quality BK7 prisms that work in tandem with the fully coated optics to produce bright, sharp images in full detail. The scope's ruer armor, meanwhile, not only protects the body but also helps you grip the scope in nasty weather. Finally, the scope is nitrogen-purged and O-ring sealed, creating a fully fogproof and waterproof performance whether you're in the field, at the shooting range, or on a hillside viewing wildlife. The scope comes with a hard-shell aluminum case, soft case and tripod. We will work with you to resolve any problem you may have. We reserve the right to cancel any order for any reason at any time. We are not responsible for undeliverable addresses. All of our items, unless otherwise stated, will only run on 120 volts. Please check to make sure your country complies with these specifications. The item "Simmons ProSport 20-60 x 60mm Waterproof/Fogproof Spotting Scope with Tripod" is in sale since Friday, October 30, 2015. This item is in the category "Sporting Goods\Hunting\Scopes, Optics & Lasers\Spotting Scopes". The seller is "fanteller" and is located in US. This item can be shipped to United States.